For many years, we have been very careful at Little House to be sure to add our needs to our Christmas want-lists. We frequently are on a tight enough budget that we don't always have monies for both needs and wants. With this in mind, we have all learned to shop very hard and also plan ahead. I am ready this year, not just to make New Year's Resolutions, but actually have all that I need to achieve them. I discovered ebay and have learned I can find what I am wanting at great discount prices. My latest discovery is finding high quality "next-to-new" or " new seconds" name brand shoes for but a fraction it would cost to buy them if at full price. I have also found this to be true for bed linens as well as sewing notions, but I will share that in other blogs. I am realizing that I have bought all sorts of things that haven't suited my needs and am learning to profit from others that are recycling such items and will follow suit to market mine on ebay in the near future. "One man's junk is another man's treasure!" By trying on name brand shoes at the store, I found what brands work for my feet, the right size and style and then I go home and find them on line at prices I can better afford. There is even an enlarging lens on ebay that you can use to carefully inspect pictures to find items with little signs of wear that are "like new". Some may feel this is less sanitary, but how often do we try on shoes at stores that someone else has tried on and I am finding that these next-to-new shoes aren't much different, as there are hardly any scuffs on their soles. 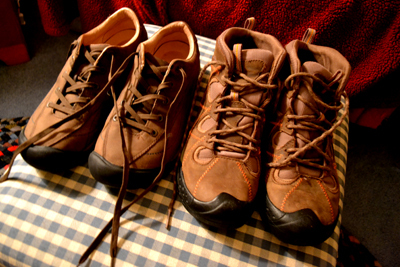 Need some good shoes or boots, try ebay! 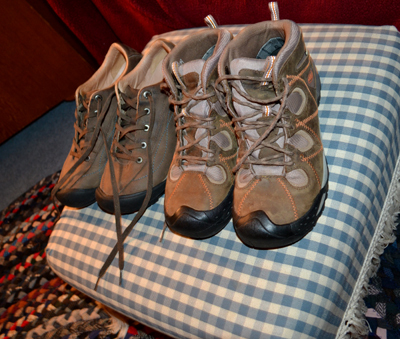 These boots and shoes were examples of such buys that were so significantly reduced that instead of one pair, I have purchased three, though only pictured are the two that I will use for my new walking and hiking needs. This year instead of simply making New Year's Resolutions, I have prepared to make them happen. 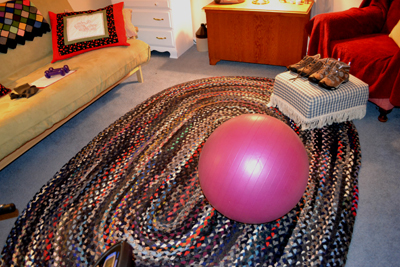 My "new" playroom/guestroom, great for exercising! I have been on the Marshall Protocol for the past 7+ years to treat Chronic Lyme Disease. It is a program that increases inflammation in order to fight infections that aren't killed off with lesser sorts of treatments. 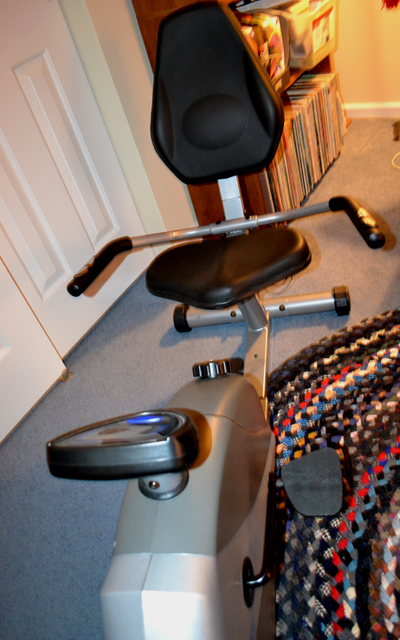 I eagerly planned for when it would be discontinued and I could return to exercising, albeit slowly. 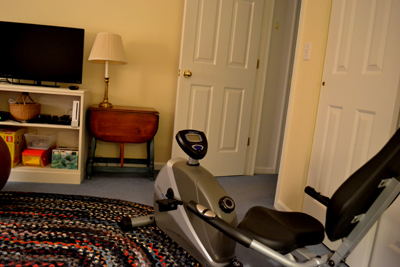 New dumb bells, an exercise ball, a hand-me-down recumbent bike and a cushy rug moved to our newly emptied extra playroom/guestroom and my workout room is ready to go complete with TV. I even signed up for some physical therapy this last year so as to be prepared for a more active exercise program. 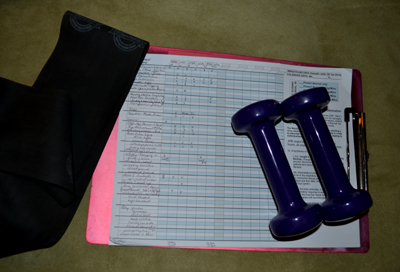 Home exercises with resistant bands continue to be part of my daily program at this time. I even made a check list to help me remember them all, so as to maintain as well as continue to strengthen my body. I will have no excuses for NOT taking the time to make my New Year's Resolution to "get healthier" happen in 2016! Sometimes our plans aren't always so straight forward, especially when it comes to chronic illnesses, so if you aren't to this point, don't despair, but rather plan ahead for when you can tackle whatever it is you want to achieve. Sometimes that is the best we can do! My "new" hand-me-down recliner chair to watch TV! I would likely never be comfortable without a TV to entertain me!! For those of you that don't have physical challenges, all this planning and preparation may not be so necessary. I am looking forward to being able to do more, having weaned myself off the Marshall Protocol for the past several months. It has been a treatment that I hope helped to decrease what was thought to be an active ongoing chronic infection. But cured or not, I am now looking forward to working toward my ultimate goals of getting back to lap swimming and walking safely inside and out, on level and un-level ground, though I am real that it will only happen gradually and with effort. Being able to move well is not something I take for granted and how necessary it is to keep moving to gain or at least maintain strength! "These boots were made for walking....and that's just what I'm gonna do...one of these days, I pray that these boots are going to walk all over" to wherever I want to go!! Of course 2016 will also bring sewing, writing and reading therapies as well! Happy New Year to you all!! May your New Year's dreams come true in 2016!! "One of these days, these boots are gonna walk all over to where I want to go!" Labels: New Year's Resolutions. Setting and achieving goals. "Special Education" applied to adult challenges.